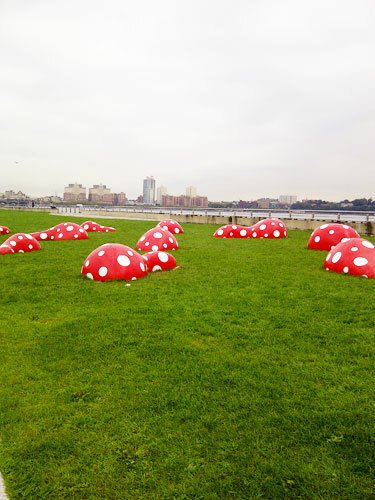 you could say that yayoi kusama, the queen of dots, has landed in nyc. a retrospective on the japanese artist’s works, which has been circling the globe for the past few months, popped up at the Whitney Museum around mid-July and will be there thru Sep 30. you’ll also see yayoi’s very polka dot friendly collaboration with louis vuitton in stores. and this morning, as we took pearce the puppy on his morning walk, we snapped a picture of yayoi’s guidepost to the new space installation along the west side highway. what do you think? does yayoi inspire you to go all dotty? and here’s a page dedicated all things yayoi!! Previous Postliberty remnant necklacesNext Postwe’ve gone dotty!